PRK is based on the concept of correcting your vision by altering the surface of the cornea. With this method, no flap is created and only the surface layer of cells, the epithelium, is removed. The reshaping of the cornea is done on the exposed collagen layer of the cornea and the epithelium re-grows by natural healing in four to five days. Here at Oftum, we practice PRK / ASA ( Advanced Surface Ablation) 6D - this is the transepithelium surface method. It is without touch, without pain, and has a quick recovery. This new non-contact, minimally invasive surface method is performed in two stages within a few seconds. First, using a high precision Excimer Laser , the surface layer of the cornea (epithelium) is removed. In the second stage, the Excimer Laser reshapes the cornea to correct your vision. 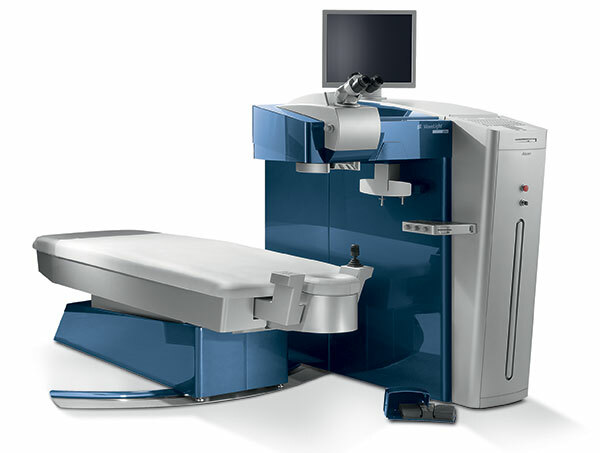 Throughout the operation, the patient perceives laser lights of various colours and is focused on a green blinking light in the centre of their vision. After the procedure the cornea is rinsed with a cool solution, and eye-drops and a therapeutic “bandage” contact lens are applied. The latter is left for 4-5 days as the epithelium heals, after which it is removed. "I just watched the green light blinking and perceived this blue-and-red light show for a few seconds and then, it was over.“ Thomas S.
PRK and all surface methods (such as LASEK) have a longer recuperative period than ReLEx SMILE 3D and Femtolasik 6D. However, the aftercare starts the same way - RELAX! We recommend that you rest, sleep and maintain the schedule your of eye drops, as well as using the sunglasses provided when going out. During the first 24-48 hours you may suffer from increased light sensitivity, eye-watering and the sensation that you have a foreign body in your eye. After 24 hours, however, almost all patients are without discomfort. On the 5th day, we will see you for the removal of your therapeutic contact lenses and your first post-surgical inspection. Continue with your eye drops and continue to avoid exposure to bright lights. On your 10-14th day, we will see you again for another check-up and your first sight test! And finally after a month we will check you again - through all of this, you will continue with your schedule of eye drops as prescribed by us. Your vision may continue to stabilise and improve for up to six months after surgery. There are certain patients for whom PRK is uniquely suited, but due to the slower recovery period and greater discomfort, most nowadays opt for either Femtolasik 6D or ReLEx SMILE 3D. Also, as you can see, for the travelling patient, the aftercare requirements of PRK are less suitable. If PRK is the most suitable for your clinical requirements, however, you can rest assured that this is what we will recommend for you.